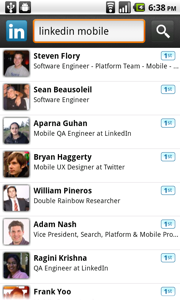 Just in time for the holidays, the mobile team and I are excited to announce the availability of the LinkedIn for Android Beta app! Our Beta application is available worldwide on any Android phone running OS 2.1 or higher. This is the first time we’ve done a public beta for a mobile app here at LinkedIn and we have more features we’ll be launching in upcoming versions. But given the demand, we wanted to get this out to you for the holidays and look forward to hearing from you what works and what new features and scenarios you’d like to see in future versions. 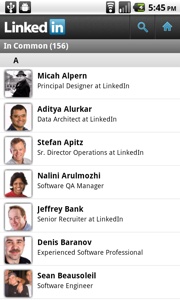 To get the app, all you need to do is join our new LinkedIn for Android group. Once you’ve joined, you can quickly access the instructions to download the app and get started. We encourage everyone to come back to the group for support or to give feedback. 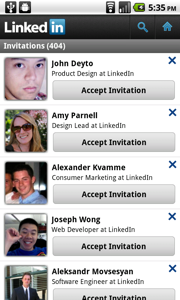 It’s the best way to stay in touch with the mobile team here at LinkedIn. 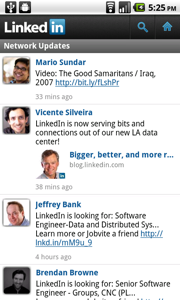 Staying connected to your professional network is one of the most important activities we offer on the new LinkedIn Android app. In our Beta app, you can view your connection updates from the Updates screen. These include newly established connections, changes to people’s profiles, and important articles and information being shared. Whether you are looking for things you have in common with a prospective client, or just want to connect with someone you’ve met at a conference, the Search feature in our Android app has you covered. It’s the fastest search experience we offer on any mobile platform, and makes it easy to find people quickly. Once you’ve found the person, you can view their profile to learn more about them, invite them to connect, or view who you have in common. Sending and accepting invitations are an important part of growing your network. You can send invitations by viewing the profile of someone you’re not connected to. 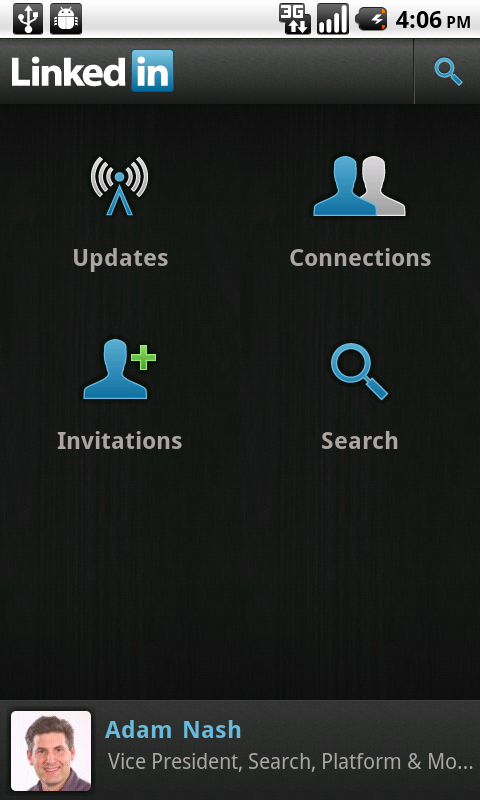 To see the invitations people have sent to you, just tap the Invitations icon in the app. As we mentioned earlier, this is an early Beta and we’ve focused on delivering a great experience based on the most commonly requested features. In the coming months, we’ll be delivering updated versions of our Beta app that adds new features like access to your Inbox, sharing and commenting on updates, and our popular “People You May Know” feature. For now, we hope our members will find our Beta useful, and we look forward to hearing from you as you try out the app. To download the app now, or to give us feedback and talk about your ideas for LinkedIn on Android, please join our LinkedIn for Android group today! 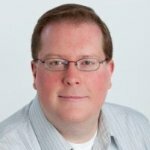 LinkedIn for BlackBerry: Storm and Pearl Join the Party!